Zesty peppery and bitterly fresh, arugula is a rich vegetable full of antioxidants, vitamins and other essential minerals good for your health. Arugula ‘s richness in flavor and texture makes them a versatile vegetable that can go well in lots of dishes be it soups, pizzas, sandwiches but I find them best enjoyed fresh in a salad. Arugula can be enjoyed on its own but it’s bitterly peppery flavors are best complimented by the sweetness of the sweet potato. A root vegetable itself, the humble sweet potato comes packed with healthy sugars, dietary fibers, and nutrients. This salad will take you little time to prepare, is light on your tummy and will provide you with the energy and nutrients to get you through your day. This will be perfect for a pre-workout meal paired with a sandwich of choice. The roasted potatoes hold the dressing well and can be carried to work for healthy snacking. All these wonderful fresh flavors are brought together by a simple balsamic lime vinaigrette for an easy to prepare salad that is packed with nutrients and flavor. Peel and slice your sweet potatoes into bite-size cubes and roast them in a preheated oven at 190℃ for 30 minutes flipping halfway. While baking wash and drain your arugula until completely dry. Prepare the tomatoes by chop[ing them. When done take your potatoes out of the oven. 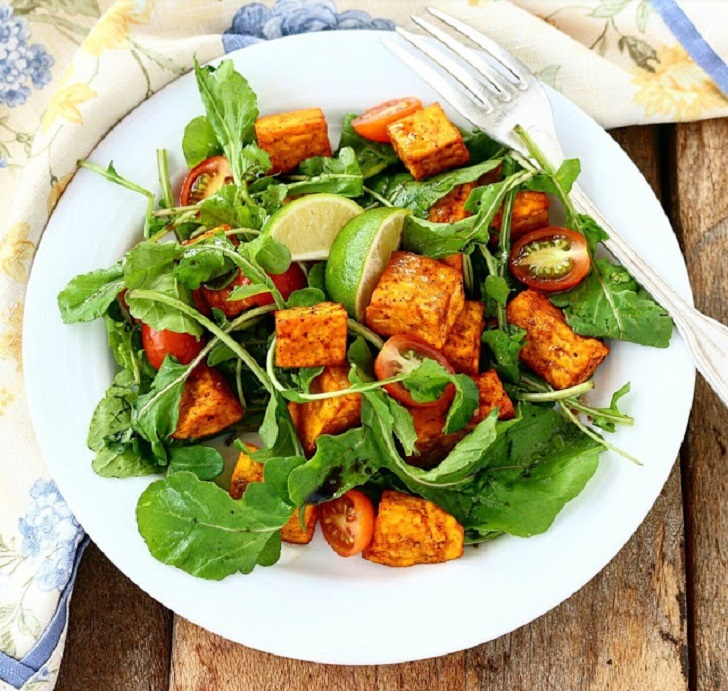 In a large bowl mix together your arugula, sweet potatoes and tomatoes. In a small container, mix your vinaigrette ingredients and shake well. Drizzle over your salad and gently toss to coat saving some for later.